Life at Stamping Details: Witchie Poo with Sharon is back this year! Class is this Sept 21st and 26th! Witchie Poo with Sharon is back this year! Class is this Sept 21st and 26th! We will be using chalk to color, Ultra fine Sharpies to draw the face and kitty face. A little stamping using Black Stazon. Come and create with Sharon. 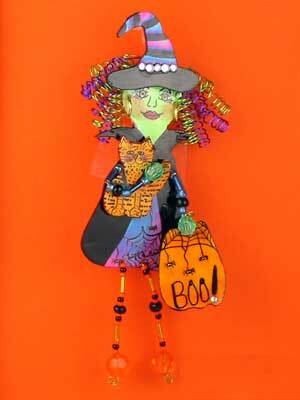 She's (Witchie Poo) fun to make! Please bring your favorite scissors to cut shrink plastic. Creating her own embellishments and jewelry has been a delight for Sharon. Shrink plastic creations are Sharon's favorite medium other than paper. It is a fun product and craft that she has been working with for over eleven years now, and it is still fun for her! $26. Includes all class materials.